Protesters opposing U.S. Supreme Court nominee Brett Kavanaugh held a demonstration across from the American Bar Association headquarters in Chicago on Thursday. The crowd numbered around 30 at 5 p.m., grew to around 100 at its height, and had dispersed by 6:50 p.m. 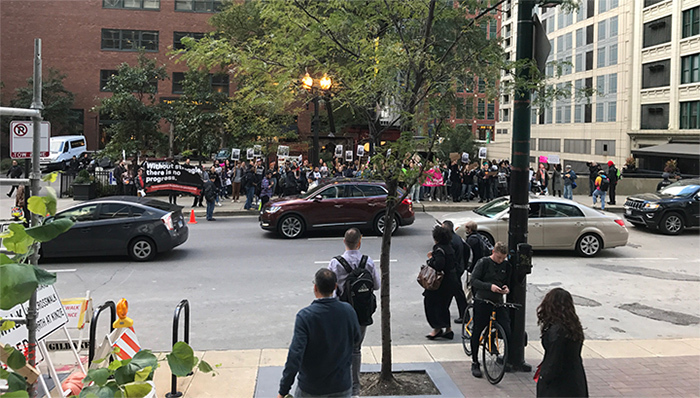 The Chicago District of the International Socialist Organization posted the event on its Facebook page, saying that it was endorsed by the International Women’s Strike, International Socialist Organization, National Lawyers’ Guild, Our Columbia, Columbia Faculty Union, and the DePaul Students for Reproductive Justice. Students Zoe Kirk of the Illinois Institute of Technology and Aneesah Shealey of DePaul said they came to the protest because they opposed Kavanaugh’s nomination and were very concerned about safeguarding reproductive rights. “I’m extremely frustrated, and especially disgusted by the attitude that he’s entitled to be on the court,” said Kirk. The leaders of the various organizations who’d planned the march were also initially under the misperception that the ABA is involved in lawyer discipline and disbarment, said protest attendee Laura Sabransky. They soon learned that this is not the case, and that the ABA is a voluntary membership organization rather than a lawyer disciplinary agency. But they still felt it was an appropriate venue to hold a protest. Sabransky was a Bernie Sanders-supporting delegate to the Democratic National Convention in 2016, but was not attending the protest as a representative of any organization. “While they may not be able to disbar him, I think they should use their power to influence the regulatory body that can,” she said. The ABA declined to comment on the protest. On Friday morning, the chair of the ABA Standing Committee on the Federal Judiciary alerted the Senate Judiciary Committee leaders that the group will be reopening its evaluation of Kavanaugh. A view of the protest at its beginning, around 5:00 p.m. The crowd later swelled to around 100 protesters. Why do Democrats and Republicans see Kavanaugh is such different ways?